To tie in super closely with our Turn Key connect-the-dots easy to follow SEO, we have just performed a thorough restructuring of the site layout and menu structure in SEO Breakthrough. 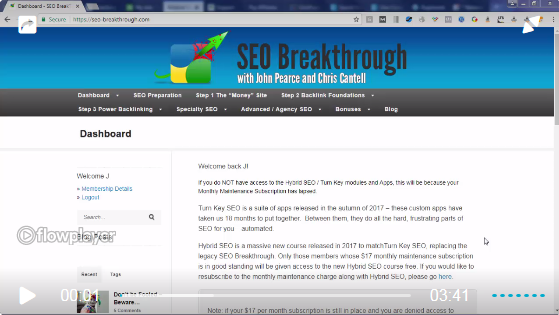 SEO Breakthrough has always been a step-by-step system, but we hope that this site layout will make it even easier to follow along – quite literally, step by step. The new menu structure should be visible to all logged-in Turn Key members – those include anyone who has joined us in the last 6 months, and also any older members who have purchase the Phoenix Authority Site Restorer. If you are an older member and do not see the new menu structures, you can purchase Phoenix after watching our coaching webinar here. Now, go and connect the dots and rank those sites! Thanks John & Chris for the best SEO training/system EVER! When I first saw all of the work required to get a site to rank these days, I felt a bit overwhelmed. You have really made it extremely simple with your step-by-step approach and done-for-you services. You take the difficult/boring tasks out of SEO and make it fun again! I sure do appreciate everything you two (and team) do for us. This layout will certainly be more visually appealing for new members, too.